1Dicle Üniversitesi Tıp Fakültesi Göğüs Kalp Damar Cerrahisi Anabilim Dalı, Diyarbakır Aim of investigation: Vascular injuries in children are less frequent than in adults and iatrogenic causes consti­ tute the most common etiology. The aim of this report is to characterize traumatic upper extremity arterial injuries in children. Methods: in the last 8 years hospital records of 37 childrnn less than 15 years old who were managed in our clinic due to traumatic upper extremity arterial injury were retrospectively reviewed. Results: The mean age was 9.44±3.86 years (range 3-15). Trauma was penetratingin 75.6 % and blunt in 24.3 % of the cases. Brachial artery was the most commonly injured artery (40.5 %). The injured artery was repaired in ali but 2 patients. 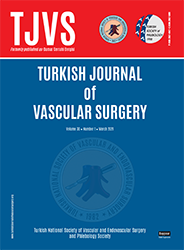 End-to-end anastomosis was performed in 26 and saphenous veiıı graft replacement in 10 inju­ries. Nerves were injured in 43.2 % of the cases. The ratio of associated bone fractures and venous injuries were 18.9 % and 16.2 %, respectively. AII associated injuries were managed at the same time of the arterial repair. Mean hospitalization period was 6.45±3.28 days. There was no in-hospital mortality.